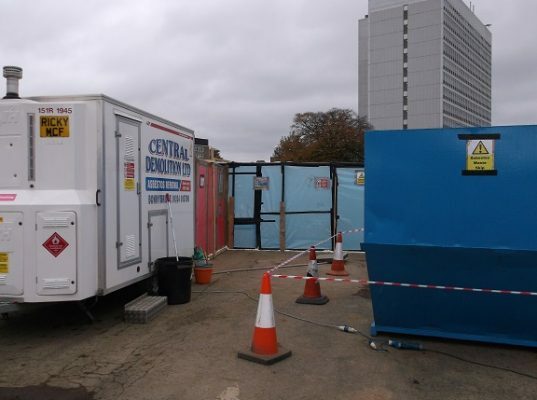 Central Demolition Limited were awarded the contract for the demolition of St Andrews Memorial Hospital. The buildings on site ranged from single storey to 3 stories high, and were of masonry construction. 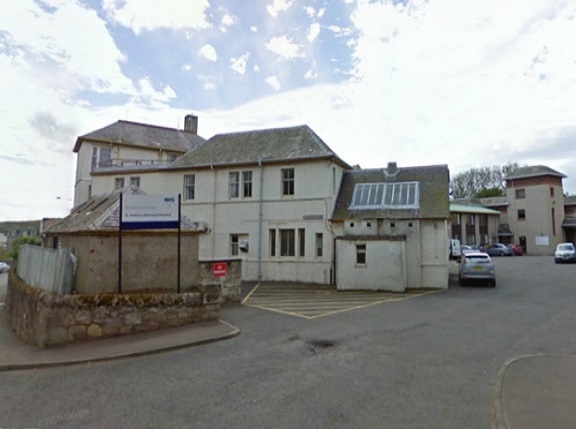 The former hospital in St Andrews was being demolished for Watkin Jones, who are redeveloping the site. Further to site set-up and comprehensive inductions for all operatives, we began our works. Some pre-preparatory work was required prior to demolition, including asbestos removal and soft stripping. 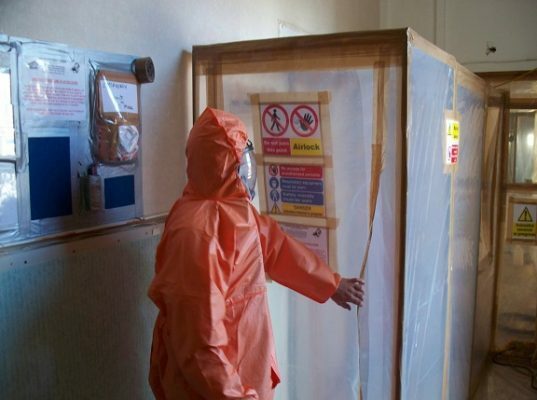 An asbestos survey carried out prior to our commencement on site had identified a small quantity of asbestos, all non-notifiable, which was subsequently removed by one of our specialist asbestos removal teams. Further to the removal of the asbestos, a team of operatives manually soft stripped the buildings of all non-structural fittings, finishings, doors, timbers etc., with all materials being deposited into skips for removal off site. In addition, the roof slates were carefully removed and salvaged in conjunction with a bat ecologist. The demolition works involved the demolition of all buildings, basements, foundations and hardstandings. The demolition of the buildings was undertaken in a progressive manner. The roof trusses were removed first, and then the walls were demolished inwards so that the debris remained within the building footprint. The demolition process was repeated for each floor and each building until all of the buildings were fully demolished to ground level. All suitable materials (concrete and brick debris) arising from the demolition works were crushed to 6F2 to be used within the construction of the new buildings. An excavator was used to grub up and break out the concrete floor slabs and strip the foundations, with materials arising being cleared to the stockpile as work proceeded. At the end of each day, all voids created were backfilled. 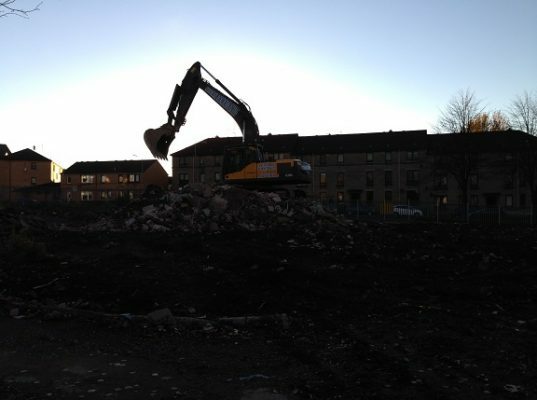 The site was very tight, so we had to manage the stockpiling of demolition material and crushed material so as to keep the site safe. As part of our contract, we created piling mats and used a bulldozer to create the required levels for the new build. Also, drainage on site was tracked and capped off using concrete, and marked on drawings for client’s use. This site carried no major risks, other than those inherent to asbestos removal and demolition works. However, there were several challenges. Due care had to be taken as there was local housing in close proximity to the site. Due to the presence of residents around the site, a banksman was on duty during machine operations to ensure that no unauthorised personnel were allowed within the area of demolition. To minimise the disruption to those neighbouring the site, we actively supressed the dust created during the works and kept noise to a minimum. So as to avoid disrupting traffic and inconveniencing drivers, we had a traffic management plan in place for the removal of debris off site by our tipper lorries. Overall, this project was a success. The works were completed safely, on time and within budget. We hope to work in partnership with Watkin Jones again in the future should the opportunity arise.